On such a large scale operation as we have here at Walls4Paws it was an increasingly more expensive problem for us to remove dog poo from site as we are unable to utilise the domestic bins supplied by the Council. What to do? 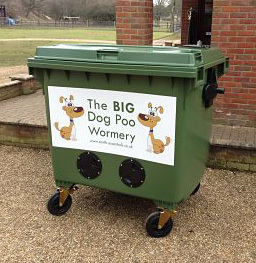 On a trip to Crufts 2013 we found our solution in the form of a wormery…..However this wormery came with a difference, the worms eat dog poo and make usable compost which can safely be spread over the garden and amazingly there is NO smell. Not only is this cost effective and smell free you can use it for garden and kitchen waste too. If this is something you are interested in please fee free to talk to me. 1. Safe4 does NOT contain harmful Phenols, Aldehydes or Alcohol. 2. Safe4 in working dilutions has neutral pH of approximately 7.6. 3. There is no need to sluice away with water after application and can be immediately brought into direct contact with animals whilst still wet saving you valuable time which can be better spent caring. 4. Safe4 is NON-toxic, NON-corrosive, NON-staining, NON-tainting and a NON-irritant at all working dilutions. 5. Safe4 is kind to the environment being water based and biodegradable.